- Heat the olive oil in a pot (with no lid). Season the meat thoroughly on both sides with salt and pepper. Then add the meat to the pot and cook on lively heat for 3 minutes. Flip the meat over with tongs and cook on the other side for 2 minutes. - Add an ecodose of water, a bit of salt and pepper, and close the lid. Set the valve to position 2 and cook for 5 minutes, starting from when you hear the first whistle. - Turn off the heat, gradually let the air escape from the valve and remove the lid. Remove the meat from the pot and place it on a dish to rest. In the meantime, place the pot on medium heat, add butter and the Worcestershire sauce. Mix well with a wooden spatula, making sure you stir the cooking juice at the bottom of the pot. Then add the Armagnac and continue to cook and stir when necessary, in order to obtain a slightly thick sauce. 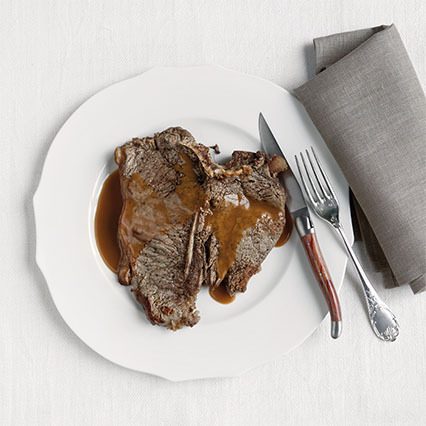 Set the entrecôte on a serving dish, and serve hot with the sauce on top.